This is a Sigmari weapon used by soldiers and hunters. 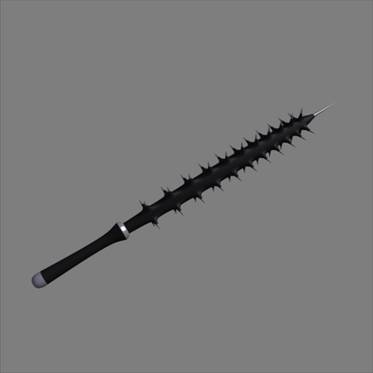 It is an unpowered weapon made from the tooth of a Kage (pronounced Kah-gey), a giant dragon-like predator. Kage Clubs are not sold. They are either handed down from parent to child (often for generations) or they are ripped from the maw of a living Kage (the Kage is rarely killed during this process…but quite a few Sigmari are eaten when trying to obtain one). 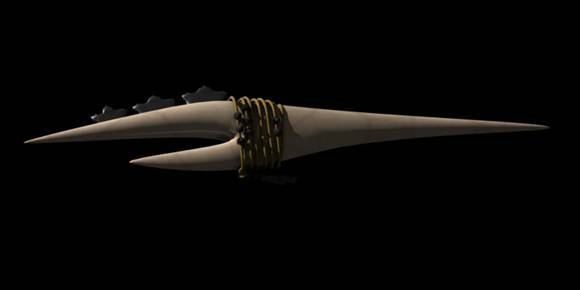 The Kage is treated in traditional herbs and solutions to preserve and harden it, mega-damage dinosaur hide is wrapped and bound under the spikes to keep blood from flowing down and loosening the Sigmari’s grip, and metal blades are usually added to the striking end, creating a war club/axe hybrid. The amount of force focused into those metal tips by a well-trained, powerful Sigmari is devastating. It can only be wielded by beings with supernatural strength. Anyone else is lucky to be able to lift the things (remember that these come from a planet with twice the gravity of Earth and have a dense internal structure). There are no “modern” equivalents of a Kage. They do more damage per strike than most high-powered mega-damage rifles just due to the strength of their Sigmari wielders. Damage: Supernatural punch damage, plus 3D6 M.D. Bonuses: Opponents are at -2 to parry this weapon due to the sheer strength behind it. Trying to block a Kage swung by a Sigmari often just results in you getting a broken arm along with having your skull caved in. Market Cost: Unavailable and not for sale. Kage are inherited or earned on the dangerous plains of Sigmar. 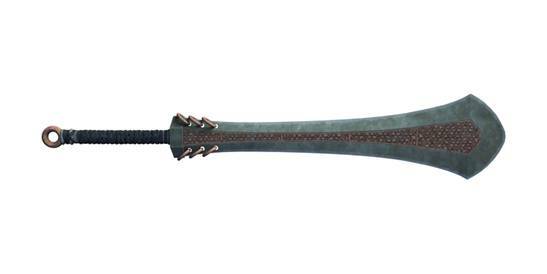 This is a traditional Mogg’Theran weapon that is a combination sword and spiked club. A classic kalar has rows of four spikes going down a metal pipe attached to a two-handed hilt with a spike on top. 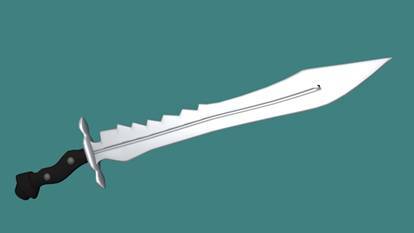 It is an excellent attacking weapon and very effective at parrying. It causes grievous wounds on its victims. However it is impossible to use a kalar as a paired weapon. It is traditional to wield them two-handed, although they can be used effectively one-handed. Traditional kalar are simply steel or iron, but modern hi-tech kalar constantly build up an ion charge that is released upon impact. Damage: Traditional: 3D6 S.D.C., but Modern kalar do 3D6 M.D. Bonuses: If the wielder has W.P. Blunt, they receive an additional +1 to parry whenever they use two hands to wield a kalar. Payload: 50 strikes per power pack for a modern kalar. Market Cost: 350 to 2,000 credits for a traditional kalar depending on quality and style. 10,000 credits for modern kalar. Very common, particularly in the Empire of Many Suns. Popular among bounty hunters, pirates and mercenaries, the Omegablade covers the cutting edge of the blade in a magnetic field filled with high-energy plasma. Generating temperatures as hot as a G-type Star, the resulting cutting edge can slice through almost anything. Because it is, technically, an energy weapon, it is of little use against the Arkhon, and is far more popular in the Free Colonies. The magnetic field keeps waste heat from escaping, and the sword shows up brightly on thermographic detection gear when activated. Power Pack Duration: Two hours before needing to recharge. Comes with a special sheathe with a built-in recharger and spare gas canisters to renew the hydrogen used to create the plasma field. Market Cost: 16,000 credits. Good availability. These rare and nearly priceless weapons are found in some ancient Kalabar ruins. They are never for sale and one generally has to find one or kill its previous owner. These weapons appear to psychically attune themselves to their wielders, and their powers are enhanced by the presence and use of psychic and magic abilities. Similar to an Omegablade, the damage from the edge of a Novablade is from heat. However there is no plasma field or other visible means of generating that heat, nor do the weapons register as magic. Most experts assume they were created with a level of technology that most species currently just cannot even detect. In addition to sheer damage, the Novablades also grant the wielder a number of psychic and magic abilities dealing with fire and heat. Finally, these amazing weapons vary in size according to the wielder, although their damage is generally the same. Weight: 14 lbs. for a human-sized wielder; these are heavy, two-handed swords for whoever holds them. Mega-Damage: 1D4x10 M.D. plus punch damage from supernatural strength (if any). Any being with a supernatural P.S. of 40 or more does 2D4x10 M.D. plus punch damage. Special Abilities: Each of the following abilities can be used once per hour, or can be fueled at the normal cost by the wielder’s I.S.P. or P.P.E. (even if the wielder does not have the psionic ability or spell themselves). Magic Spells: Cloud of Smoke, Extinguish Fire, Impervious to Fire, Fire Ball. Psionic Abilities: Nightvision, Resist Thirst, Summon Inner Strength, Healing Touch, and Pyrokinesis. The level of the spell or psionic ability is equivalent to the level of the wielder. If used by a mage, all magic spells have double damage, duration and range, and if used by a major or master psychic, all psionic abilities have double damage, duration and range. Bonuses: The wielder is impervious to cold and cold-based attacks and has a +2 to save vs. horror factor. Market Cost: Priceless. 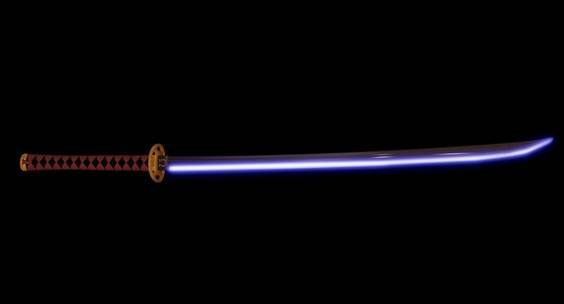 Were someone to sell one of these swords it would go for 10s of millions of credits, possibly as much as 200 million. The Shok-Tar is the Sigmari polearm, used as both a spear and halberd. It is light (comparatively), strong and multipurpose. It can be set for a charge, thrown, combined with a shield and used as part of a phalanx or just wielded by a lone combatant as a two-handed melee weapon. It gets its name from the distinctive whistling and humming sound it makes when whirled about, which can be made to sound like a singing sigmari child. Many expert wielders also have the skill to play it like a musical instrument by spinning it at different angles and speeds. This weapon can only be wielded by someone with an augmented strength of 20 or better. The weapons damage comes from a sonic disruption field powered by a battery in the end and the heavy superalloy materials used in its construction. It has not spread much off of Sigmar due to the uselessness of such a long weapon (10 feet tall) in starships and cramped quarters. It is also limited due to its weight, which prevents all but the very strong, like Sigmari and cyborgs, from using it. Mega-Damage: 4D6 M.D. plus any mega-damage punch damage. Market Cost: 6,000. Mass produced on Sigmar and not highly sought on other worlds, it is rare but fairly cheap. There are rumors of magical or enchanted versions of these spears. A favorite among Special Forces and ground units that expect a lot of melee action, the Shrike is a powerful vibro-blade with several small, but important features. First, it has a large handle that can be used either one-or-two handed. This also allowed the use of a more powerful power pack, giving it a faster rate of vibration with a large oscillation. This is more like a vibro-chainsaw…but neater. Its effects on the Arkhon’s distinctive armor, which is vulnerable to physical attacks, are even more pronounced. Furthermore, this blade comes with an electromagnetic grip, making disarm attacks impossible when the bearer is wearing body armor, or at least armored gloves. The grip also has a small computer chip that reads the amount of pressure put on the hilt by the palm, and shifts several free, small weights in the hilt accordingly, giving the weapon almost perfect balance. Power pack Duration: 6 hours of constant use before a recharge is required. Market Cost: 14,000 credits. Rare availability outside the military. The Zadori is a Nix polearm that has been used for thousands of years. All Zadori are permanently enchanted mega-damage items, however there are a variety of these weapons that have different magical effects. 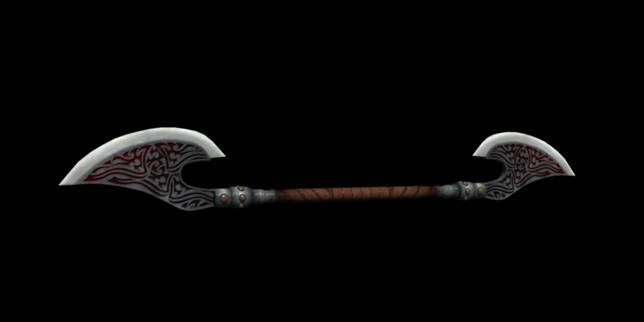 The Zadori looks like a polearm with axe heads on either end, usually facing the same way. It is held and wielded similar to a pugil stick or quarterstaff. It is amazingly light and often used with extravagant twirling and slashing motions meant to overwhelm opponents. Damage: Varies by type. The Common Zadori, which makes up about 90% of all Zadori, does 4D6 M.D. and has no other magical effects. The next most common class are elemental Zadori, which make up about 7% of all Zadori. The Air Zadori does only 3D6 M.D. but can fire a lightning bolt doing 5D6 M.D. damage with a range of 300 feet once per melee. The Earth Zadori does 5D6 M.D. and grants the user supernatural strength (allowing them to add their supernatural punch damage to the zadori’s damage). Fire Zadori does 4D6 M.D. fire damage and makes the user and whatever they are wearing or holding impervious to fire, heat and radiation, including mega-damage plasma. The Water Zadori does 4D6 M.D. cold damage and increases the user’s flexibility, giving them a +2 bonus to parry and dodge and a +4 to roll with punch, fall or impact. Wielders also have a +10% bonus to any skills that require manual dexterity, like escape artist, pick locks or piloting skills. However the water zadori must be on the wielder’s person (such as strapped to their back or held in their hand) to get those bonuses. Rarer still are the Greater Zadori, which account for about 2% of all Zadori. They do 1D4x10 M.D. per strike, can be thrown 1,000 feet and magically return to the wielder. Following that are a variety of unique Zadori who are mostly legendary and made for specific wielders. Some are simple and provide bonuses to particular attributes, some grant low-level spell abilities and a few are extremely powerful, like the fabled Zadori of Realms, which allegedly can be spun to open a dimensional rift, and the Royal Zadori wielded by the royal guards, which magically transfer any damage suffered by any of the Nix High Council to the guard assigned to protect that councilwoman. The GM should feel free to make up a variety of Zadori according to the needs of his or her campaign, but remember that they are extremely rare and in most cases are not designed to do massive amounts of damage or make the wielder a combat monster. Market Cost: 25,000 credits for even a common Zadori among the Nix. Outside of the Nix Star Alliance the cost doubles. The elemental zadori are usually valued at about 200,000-400,000 credits, depending on the seller. The other more rare Zadori are often priceless artifacts valued in the millions of credits or not for sale at all. The prices, availability and stats for these weapons, found in the Ultimate Edition Rifts main book, is unchanged and they are common weapons. Most races have some equivalent version of vibro-blades as melee weapons. They only vary cosmetically. Phase weapons and most other unique melee weapons from Rifts should generally be considered unavailable.